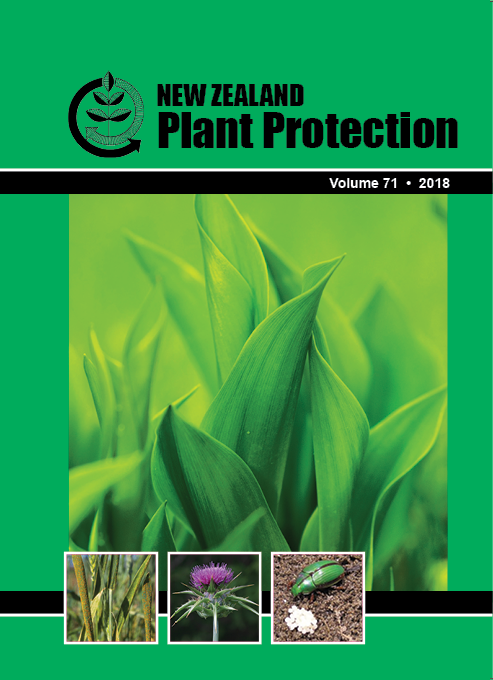 Neonectria ditissima, the causal agent of European canker in apples, conidia are available year-round in the Tasman region of New Zealand. Spore production and release in apple trees were quantified during natural and artificial rain events. Rain traps captured spores over 18 rain events (July—August 2017) from European canker lesions (excised and in planta) derived from ‘Royal Gala’ picking wound and rasp wound infections. Rain traps were monitored regularly to determine spore release over time. Differences in the number of conidia produced from lesions on the tree and excised lesions re-mounted in the tree were not significant. Lesions arising from picking wounds produced 7.2 times more spores on average than lesions arising from rasp wounds. Most spores were released within the first hour of rain and total spore release followed a logarithmic curve. Rain duration Ã— volume of water determined the rate of conidia release. Excised lesions are suitable to study the effect of biotic and abiotic drivers on spore production.